Canopies are generally specific to the lift that you have--our vendors include Hewitt, Pier Pleasure, RGC, Floe. There are many options for length & color. Available with Key-Turn, Wireless Remote, or Corded Remote. Assembled & wired in the USA. Solar Boat Lift Charging Kits available. 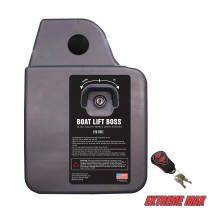 Perfect for 12/24V battery operated lift systems OR for hassle-free charging of your boat batteries. There are many boat lift accessories available to protect your boat & to make your lift customized for your use. There are many boat lift accessories available to assist with install & removal--axles & wheels, Smarte Jacks, Lift Jack.